Be daring! 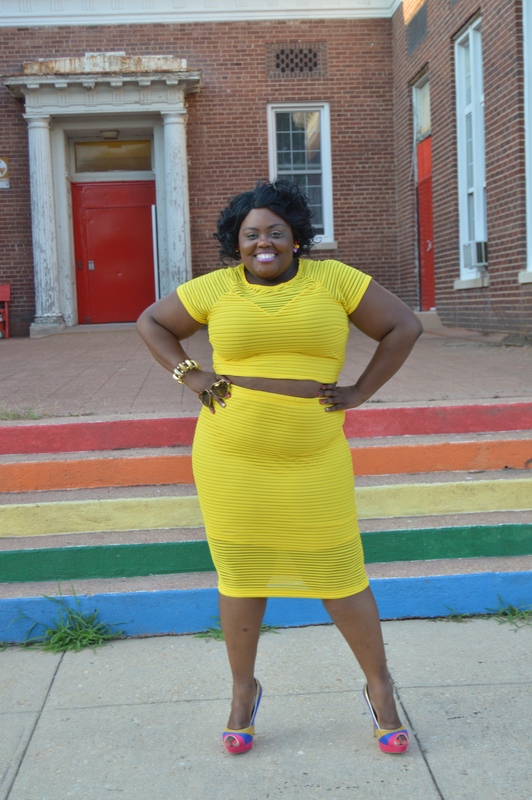 This yellow crop top and skirt set is a hitter for any entrance! I love this set! 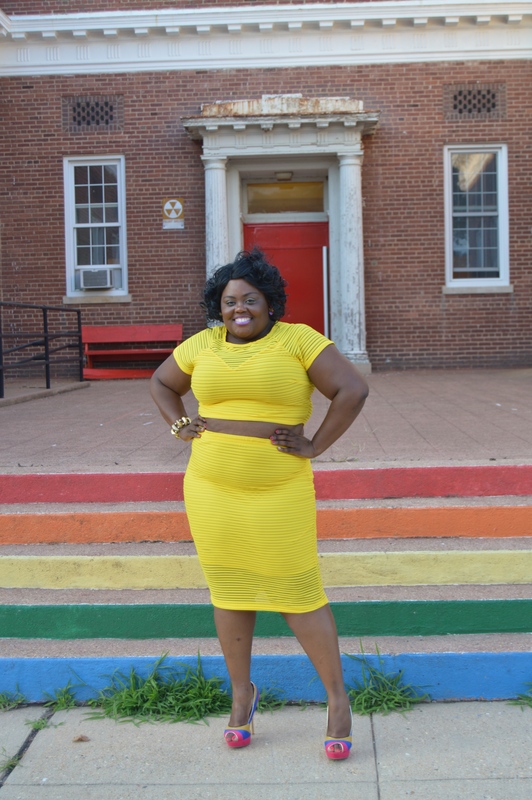 I know many say, “plus size women can’t wear a crop top”,… but we can! I have never worn a crop top before, but so many designers make crop tops look fashionably, spunky, and cute. Why not try one! 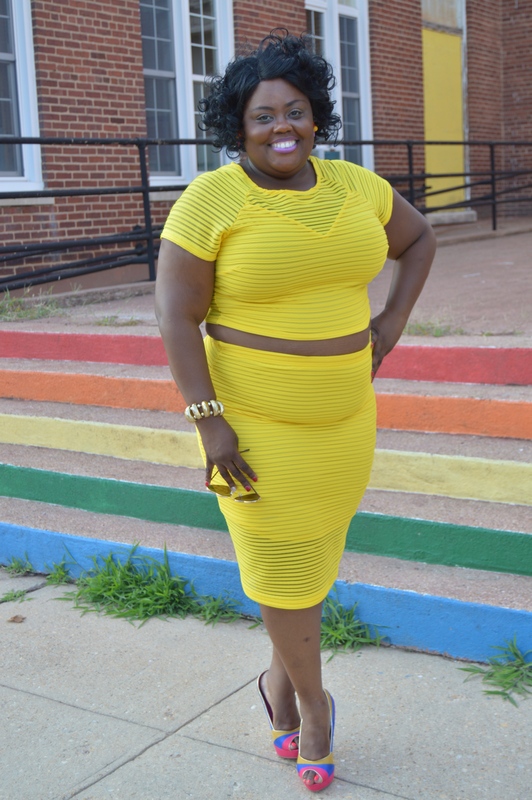 When I purchased the crop top and skirt I wanted to get out of comfort zone from not never wearing one. Please, keep in mind that I would have worn a crop top, but never had the desire until I saw the crop top in Fashion to Figure. I have had this set for a while and decided that when we (Michelle) noticed the location I knew the outfit will be a hit! The outfit and the location is a match-made in heaven. The bright, yellow outfit compliments the rainbow steps and the bright red door to give the look a seductive warning look! The top and skirt is very stretchy and very fuss free. The bright yellow sparks excitement and screams fun. The horizontal design on the top and bottom conforms to the body to give it that alluring, stylish look. The top and bottom can be worn separately. I chose to wear them together for I love two-piece clothing. The skirt is in a form of pencil skirt and hangs below my knee. Thank you to my girl T. Jones who did an astonishing job on my face! I chose to keep the accessories to a limit because the outfit is an eye-opener all by itself. Happy Looking!